A new process is to be described to explain gravitational fields. This process is called: Pelastration. We note it as [P]. A pelastration generates a new space, that is multilayered. That new space is called a holon. Pelastration - a combination of 'penetration' and 'elastic' - is a process where an impact force penetrates an infinite stretchable flexible layer of a space and carries two parts of that flexible layer as additional outer skins during all his further trajectory. In our Big Tube concept the impact force is a tube or unbreakable membrane peak. This tube pelastrates another tube in three possible ways; (1) the impact tube goes only through the top layer(s) of the impact zone (the top of the tube that is hit) and the impact tube will follow a trajectory inside that tube, (2) the impact tube goes completely through the other tube, and carries then two layers as a new skin (Top and Bottom layer), (3) the impacting tube splits in two or more sub-tubes. The multi-dimensional Universe may consists of a giant basic tube made from a tensegritic membrane (probably with a bucky-structure or nano-tube structures), but to us - in essence - the membrane is the spacetime boundary and is the only cosmological substance. The dynamic membrane acts in first instance as the PRIOR-GEOMETRY. The Big Tube sub-divides itself by pelastrations in trillions of other tube-zones and inter- and intra-dimensional tubes. First a number of basic tubes related to basic concepts and balance. Pelastration is an essential process to explain the creation of dimensions and several joining activities, but is not the only process. Sub-tubes - resulting from the pelastration of several types of tubes - can also coil, knot, etc. with other tubes and provoking changes of conditions. For example by coiling they can create temporary conditions (joined resonance by outside connection) to attract symbiotic other tubes (compare it with human reproduction). Another type of resonance is however also created by internal friction or over-heating of one or more layers in a tube-zone or the entry of new tubes (like adding new strings to the piano). There are several types of pelastrations, such as: self-pelastration (entering the own tube - to position inside or pass through)(check our interpretation of the Uroboros snake), pelastration from another tube, de-pelastration (internal tube leaving a dimension), etc. Pelastration is bound to certain conditions related such as size, tension, polarity and the effect on the impact angles. The internal fields in a tube may also influence the final behavior of an impact tube. We can also point on the Pelastration-factor [Pf]: this is the mutual exchange of tension and friction of interacting tubes. The [P] joint of the two tubes can be seen as a type of mechanical valve. Pressure changes by one or both of the tubes will influence the size of the opening. This opening will be in some conditions a 'worm-gate' accessing a different dimension. 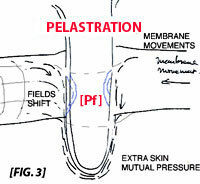 Of course pelastration is reversible due changing conditions (resonance of surrounding tubes, under-pressure in layers, changes in [Pf], etc. Remark: a torus can also pelastrate. The action of pelastration can be seen in next animated image, where two parts of a unbreakable spherical membrane can couple to make a multilayered "space" (3 layers = the basic of a 3D-space). 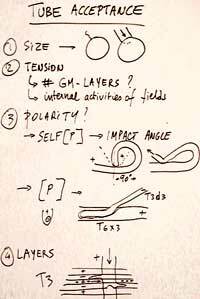 This "holon", a UNION, is just a topological sub-set (sub-UNIT) of the Membrane. 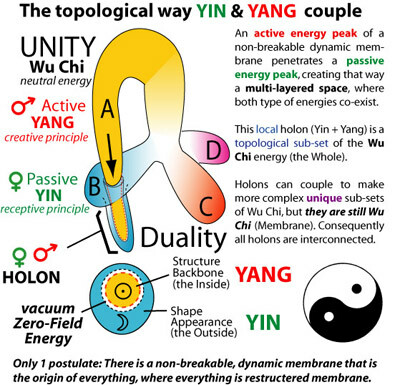 Next image gives a synthesis of the approach using Yang (penetrating force) and Ying (receptive force), where the holon is a new multilayered space containing both - co-existing - forces. This is the process or mechanism of space creation. (Membrane) Energy is locally restructured as 3D-space, which is the start of the creation of mass and thus the creation of Matter.